Kitty Pryde is a Jerk! Kitty Pryde is a jerk and really stingy when it comes to superhero codenames! The first issue of X-Men Gold came out this week, kicking off ResurrXion, the latest X-Men relaunch. X-Men Gold #1 is all about establishing the new status quo of the X-Men as a team of superheroes based in New York City. I didn’t care for it. I’ll write up my full review on Saturday, but if I were a crueler man, I’d do one of those ‘Everything Wrong With…’ videos to point out all the weird nitpicks and gripes I have with the issue. One of them really stuck out in my mind, though, and I wanted to point it out to everybody. 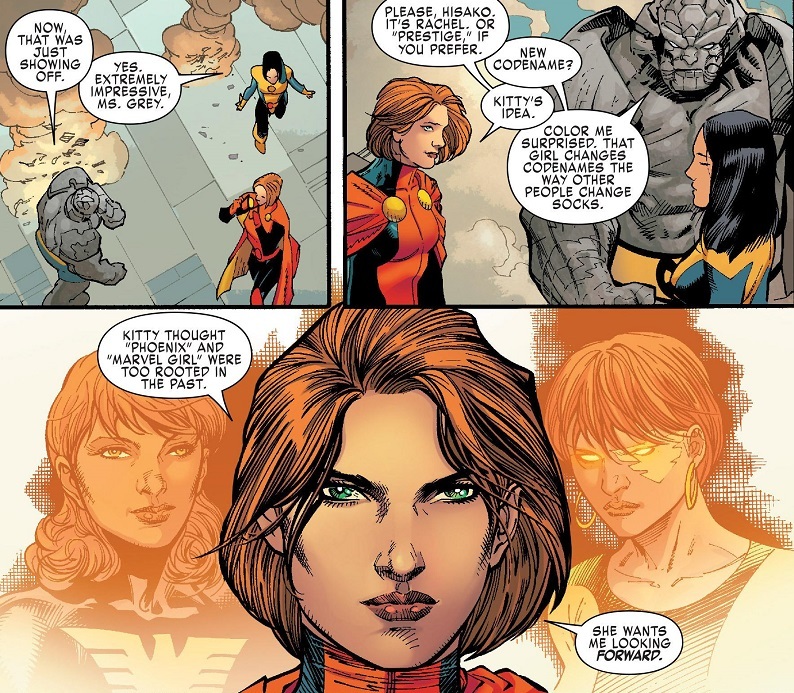 Basically, Kitty Pryde is kind of a jerk when it comes to superhero codenames. 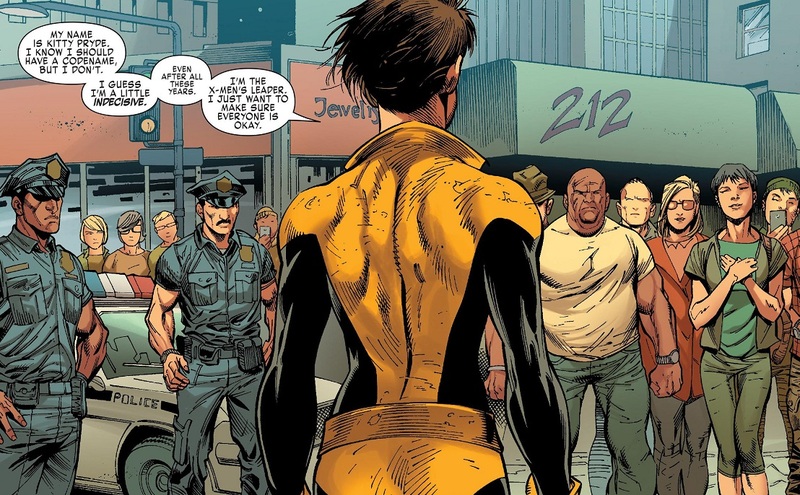 Here we see Kitty confronting a group of bystanders who hate and fear the X-Men. Notice her introduction. That seems fine. Even though Kitty Pryde is known for having a lot of different codenames, she’s mostly just been going by her real name for awhile. I don’t know why she doesn’t just go back to Shadowcat, since it’s an awesome codename, but whatever, I’m not her. She’s gotta do her. But then later in the issue, we find out that Kitty is the one who suggested Rachel Grey get a new codename. Even though “Phoenix” and “Marvel Girl” are rooted in both Rachel’s personal history and in honoring her mother, Rachel is now known as “Prestige”. That name means nothing and has no connection whatsoever to Rachel Grey. It’s as generic a codename as “Vengeance” or “Superb”. But what I want to know is, what kind of conversation did the two of them have?! Who is Kitty Pryde to go around telling people they need entirely new codenames, then doesn’t bother to come up with one for herself? And why not give Kitty Pryde a new codename or costume? Is this not a big, status quo-altering relaunch? Rachel Grey gets a new codename and costume. Nightcrawler, Colossus and Storm all revert to older costumes. Why not change Kitty up a little? A big deal is made about her becoming the new leader of the X-Men; doesn’t that deserve even a little bit of tinkering? Posted on April 6, 2017, in Comics, Marvel, X-Men and tagged Kitty Pryde, Marvel Girl, Prestige, Rachel Grey, ResurrXion, X-Men: Gold. Bookmark the permalink. 2 Comments.